Chicken broth, plain and simple. Fairly quickly, thanks to big agriculture and the decline of the single-income family (not a problem, just a fact), a post-war, hard-working American culture bought the bundle of lies sold by Don Draper’s buddies, who helped us to believe low-cost hydrogenated oils are harmless and helpful, fat will make us fat, and instant gratification is everything. We transitioned from a fairly healthy society with an egg-laying chicken and a kitchen garden in most yards – whose deaths, mostly, happened in childbirth, in infancy, or due to accidents; to one whose children have difficulty recognizing food in its whole forms, and whose deaths, mostly, are due to diet-related illnesses. But now, with the many failures of the system, the debunkings of studies that supported the pop eating culture in the last few decades, and the disintegration of American health, people are tuning back into the idea that maybe the easiest, the cheapest form of food is not better. More folks are gardening, farmers-marketing, and label-reading. Nothing is a stronger indicator that simple food is back than the ironic fact that giant food companies are capitalizing on it – buying up small farms and organic food companies, keeping the down-home, healthy names and logos, and mass-producing the products. That’s another story, though. Especially with my background as a former (very sick) victim of the standard American diet, I prefer to keep things simple, living mostly from scratch, using ingredients I have grown myself or from producers I know. Because I have a full-time job and am by no means rolling in grocery budget (and also because I believe in balance), there’s some flex in those values. Annie’s organic mac and cheese is in the back of the cupboard for days when I’m gone or tired and Joseph is all, “Ugh, there’s nothing but INGREDIENTS in this house!” About half our condiments are from the store. We are also regular diners-out, because you don’t live in this rockin’ food scene and turn up your nose. But mostly, simplicity, which includes the regular consumption of homemade foods that nourish, like bone broth. The bones of animals who were healthy at their time of death are full of minerals that are absolutely essential building blocks for a strong immune system, brain health, gut health, skin health, all kinds of health. Bone broth was a main component to my six-week journey of healing a severe gluten and dairy intolerance a couple of years ago. 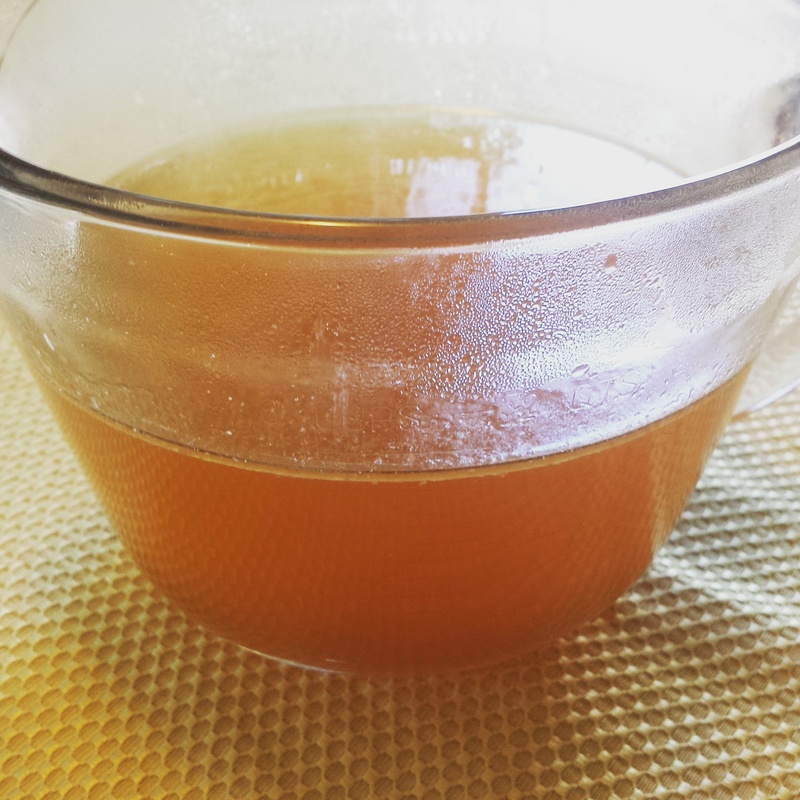 If you are suffering from digestive or autoimmune difficulties, neurological complaints, allergies, or other immune-related problems, I’d love to hear whether bone broth helps you as it has helped me. 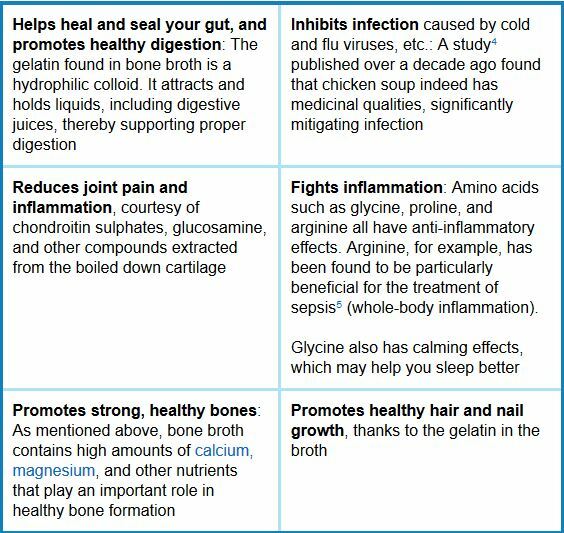 An infographic about the benefits of bone broth, by Dr. Joseph Mercola. With the popularity of today’s diet trends – including the paleo craze – bone broth is back, baby. Chefs in New York, Los Angeles, and my own ahead-of-the-weird-curve Portlandia have opened restaurants and food carts to share its magical goodness with the public. That route tends to be spendy, though, and it’s just so easy to throw it in the slow cooker and forget about it, until – ta-da! Bone broth. Place all the ingredients into your slow cooker, and fill it with clean, cold water. Covered, bring it to a simmer on high, then turn it down to low. 24 hours after you turned on the slow-cooker, ladle or pour the broth through a mesh colander into a heatproof bowl or jar. Use immediately, or refrigerate and use within a few days, or refrigerate, then portion out into freezer containers for later use. The beautiful thing here is that you can refill the slow cooker with water and start the process over again, adding more seasoning, scraps, or ACV as you see fit. This goes well for a few days! Loads of good can come out of that little chicken carcass. Even though today was hot, I really wanted soup. With the batch of broth that was ready this afternoon, I made a Hungarian vegetable soup, with a leftover quarter-pound of grass-fed ground beef, red and yellow onion, peas, carrots, dill, paprika, garlic, caraway seeds, a handful of noodles, and a little salt – with homemade raw yogurt dolloped on top. Prost! Or, as it turns out, Egészségedre! 15 Jun	This entry was published on June 15, 2015 at 3:07 am. It’s filed under Collection and tagged bone broth, chicken broth, dairy intolerance, gaps bone broth, gaps diet, gluten intolerance, homemade bone broth, organic bone broth, organic chickens, paleo, pastured chicken, standard american diet. Bookmark the permalink. Follow any comments here with the RSS feed for this post.